The made in France flexible leather cover is refillable and has a smooth texture. The genuine leather cover slips over very high quality 25% cotton, acid free paper insert that is also made in France. The leather cover is your choice red or black. It is suitable for fountain pens, gel pens and pencils. Each page has fields for date, name, address and notes. There are 100 pages; room for 800 entries. The book ribbon marker is multicolored. This is a fine traditional guestbook that would be great for weddings, special events, retirement parties and many other social events. We have the last known supply in the USA of this fine Exacompta Guest Book. 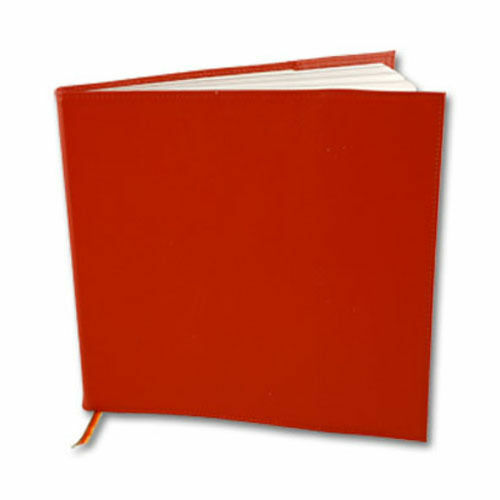 We have several of the high quality guestbook refills for sale also. When the guestbook is full you can place it on a book shelf or store it in a safe place and add another refill to the leather cover for you next event. 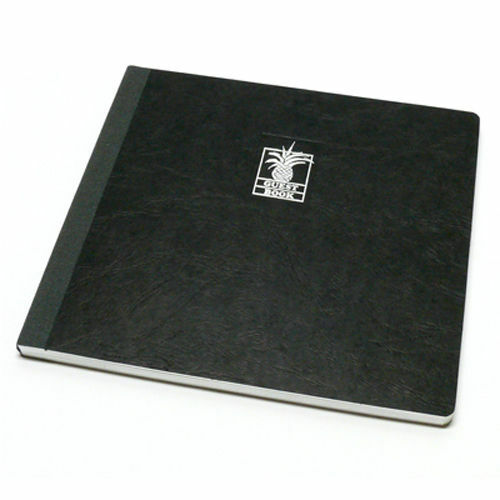 The made in France clothbound guestbook has a black textured board cover with gray cloth-binding and brilliant silver edging. 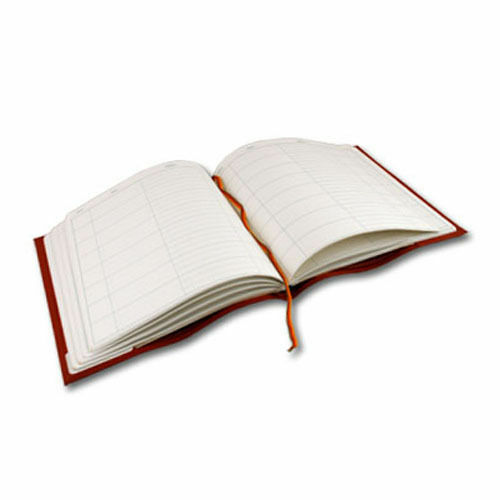 The guestbook contains heavy weight 100g paper with silver edge. The off-white paper is pH neutral, made up of 25% cotton and has a bit of texture to it. 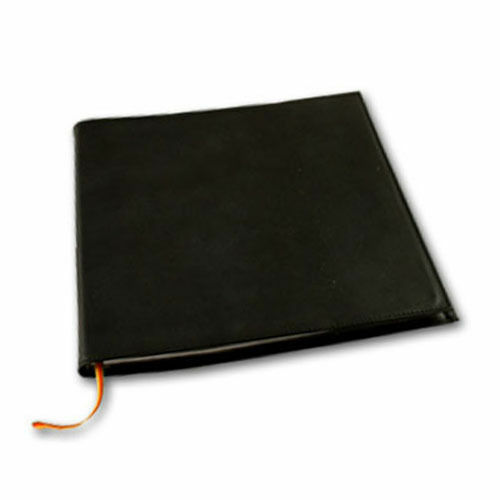 The binding is sewn so that no pages will fall out and the guestbook lies flat when open. It has a laid paper (a type of paper having a ribbed texture imparted by the manufacturing process) and the texture is slightly more prominent on one side of the paper than the other. The paper was made at the 400 year old Schut Mill (owned by Clairefontaine) in the Netherlands. They are truly lovely and special Guestbooks! The guestbooks will be available for the first time at this months (April) First Saturday at the Chicken Farm Art Center – April 4, 2015 – Saturday 10:00 to 5:00. Headquartered in Paris, Exacompta Clairefontaine is a world leader in the manufacturing and development of paper, paper products, appointment books, accessories and social and gift boxed stationery. This publicly traded company encompasses 20 other businesses and distributes its products in 57 countries. Exacompta Clairefontaine manufactures its own paper to ensure the high quality of its products. It is this tradition of craftsmanship and commitment to quality which ensures each time you use any of our fine products you experience “Le Plaisir De L’Ecriture…The Pleasure of Writing”. Whether it is a pencil, a metal nib, a ballpoint, or a fountain pen, the most basic model or a jewelry class creation, every writing instrument needs good quality paper to perform at its best. If paper comes in the form of a beautiful and fashionable diary, writing becomes a pleasure that you can carry every moment of the day.